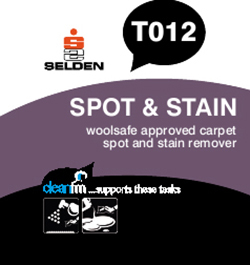 Woolsafe approved formulation Removes spots and stains from carpets and upholstery. Suitable for use on all coloursafe washable fabrics including wool. Can be used as a single solution or as a pre-spray prior to extraction cleaning. Dry spots should be agitated before application, taking care not to damage delicate fabrics. Spray into affected area, allow time for solution to penetrate the stain. Absorb the stain out by blotting with white paper or extract with a machine. N.B. Before application always test for colourfastness on a inconspicuous area.